Computer Troubleshooters understands that your privacy is important to you and that you care about how your personal data is used and shared online. We respect and value the privacy of everyone who visits this website, www.computertroubleshooters.co.uk (“Our Site”) and will only collect and use personal data in ways that are described here, and in a manner that is consistent with Our obligations and your rights under the law. Our Site is owned and operated by Computer Troubleshooters UK of Ruatha, 91 Torroble, Lairg. IV27 4DQ. Our VAT number is GB814243358. Our Data Protection Officer is Iain Mcleod, and can be contacted by email at dataprotection@computertroubleshooters.co.uk, or by post at Ruatha, 91 Torroble, Lairg IV27 4DQ. If you are not a customer and have made an enquiry regarding our products and/or services we will normally retain your enquiry for a period of 2 years after our final correspondence from you, unless you request or unsubscribe prior to this time. Data security is very important to Us, and to protect your data We have taken suitable measures to safeguard and secure data collected through Our Site. We take the security of personal data very seriously. We employ security technology, including firewalls and encryption to safeguard personal data and have procedures in place to ensure that our paper and computer systems and databases are protected against unauthorised disclosure, use, loss and damage. Personal data on our systems is only accessible by appropriately trained staff who need to access your personal data as part of their job. All access is tracked through individual login credentials and audit trails. In the event that any of your data is to be transferred in such a manner, you will not be contacted in advance but will be informed of the changes when they occur. You have the right to ask for a copy of any of your personal data held by Us (where such data is held). Under the GDPR, no fee is payable and We will provide any and all information in response to your request free of charge. 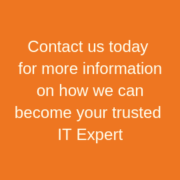 Please contact Us for more details at data[rotection@computertroubleshooters.co.uk, or using the contact details below in section 14. Before Cookies are placed on your computer or device, you will be shown a pop up banner requesting your consent to set those Cookies. By giving your consent to the placing of Cookies you are enabling Us to provide the best possible experience and service to you. You may, if you wish, deny consent to the placing of Cookies; however certain features of Our Site may not function fully or as intended. Certain features of Our Site depend on Cookies to function. Cookie Law deems these Cookies to be “strictly necessary”. Your consent will not be sought to place these Cookies, but it is still important that you are aware of them. You may still block these Cookies by changing your internet browser’s settings as detailed below in section 13.9, but please be aware that Our Site may not work properly if you do so. We have taken great care to ensure that your privacy is not at risk by allowing them.